Rob Modica created a new topic ' Bob Sharp has passed away' in the forum. I regret to inform you that long time Land Rover aficionado Bob Sharp of Tucson, AZ passed away peacefully from cancer this morning. 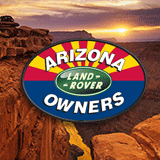 Bob was one of the first members of Arizona Land Rover Owners and was the first newsletter editor back in the 1990s. He was a good friend to all who knew him and he will be missed. ’65 Series IIA 109 Regular 25412045B “Reggie"